For this test I used Eat My Dust by Barry M as a base colour, and Black Forest by Barry M to stamp on the design (design is from Scandi 07 by Moyou). I then let the design dry for about 30 minutes before applying the top coats. This has always been a favourite of mine, and unless about 6 months ago was my go-to top coat, it dries unbelievably fast and is super shiny, but it is the reason for this test. It really let me down when I started stamping. It seems to my stamped design, pretty much, every time I use it. So I started to think that I would need to by Moyou's Smudge Resistant Top Coat to get good results, and that if this, being the most expensive top coat I own, couldn't do the job... then surely my cheaper ones couldn't. 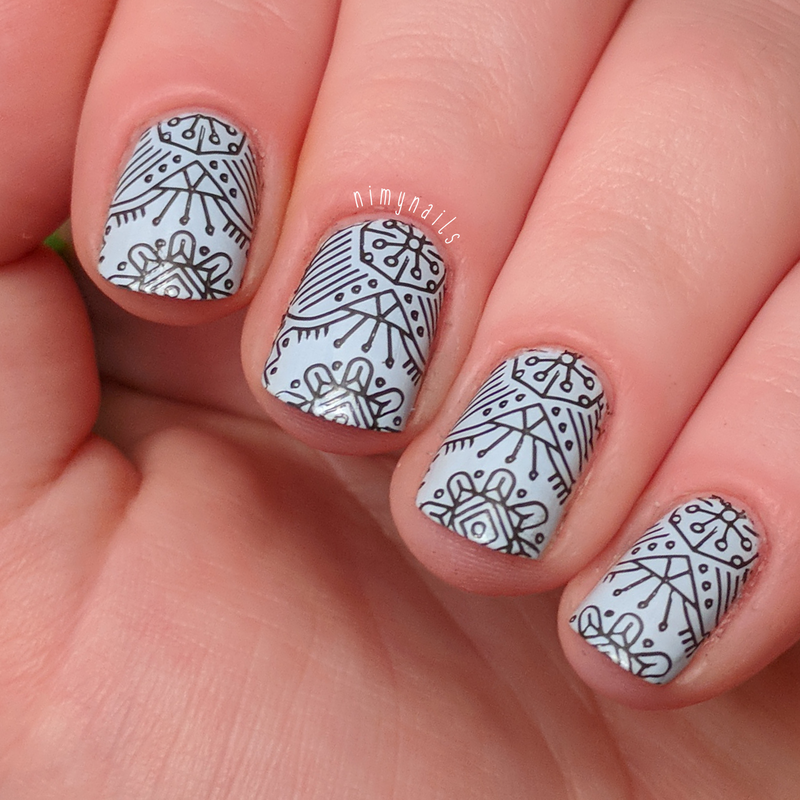 This was the biggest surprise for me, this test was the first time I tried The Gel top coat on a stamped design, and I was fully expecting it to smudge. Not to say I didn't have faith in it, I love this top coat and I use it a lot, but the formula feels a tad similar to that of Essie's and being less the cheapest on this list, I was expecting there to be a lot of smudge... there wasn't!! I got a tiny (almost microscopic haha) smudge at the tip of my nail but that is it! After it's release Wet Set quickly became my replacement for Essie's Good To Go, it is super glossy and although it dries (a tiny) bit slower, it is UNDER HALF THE PRICE, so I could deal with an extra minute of two of drying for that. This test just reinforced my love of this top coat, this was by far the best on the list, not a single smudge. This is a random top coat that I have in my collection (which I have very rarely used) but it's a top coat all the same and I thought maybe it would surprise me... it didn't haha. It is definitely the worst on the list. It smudged almost the entire design and looked awful, I don't really know what else to say about it. This is my favourite matte top coat, but it does cause slight smudging depending on stamped designs, but it definitely isn't enough smudge to rule it out as a decent option (you can avoid smudging with careful, slight strokes). 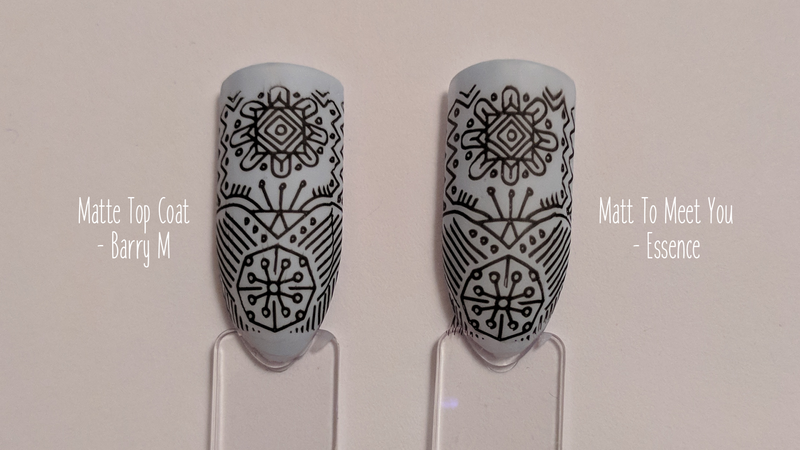 If you follow my on Instagram you'll see that a lot of my recent stamping designs are matte, and they are using Essence's Matt To Meet You top coat, I love this top coat, just like The Gel, it is amazing value for money and there was absolutely no smudging. Is probably a better option for stamping than Barry M's. 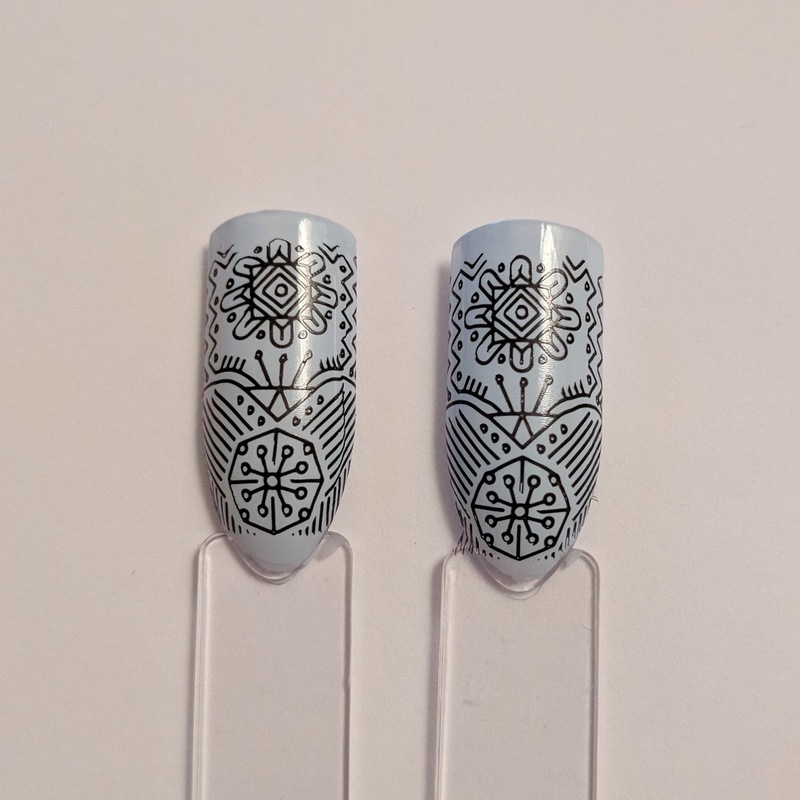 If you are looking for good top coats to use for nail art stamping, do not assume that the more expensive will perform the best... as this test has proven, that is not the case. Save your money and go with either Barry M or Essence they were all under £3!! 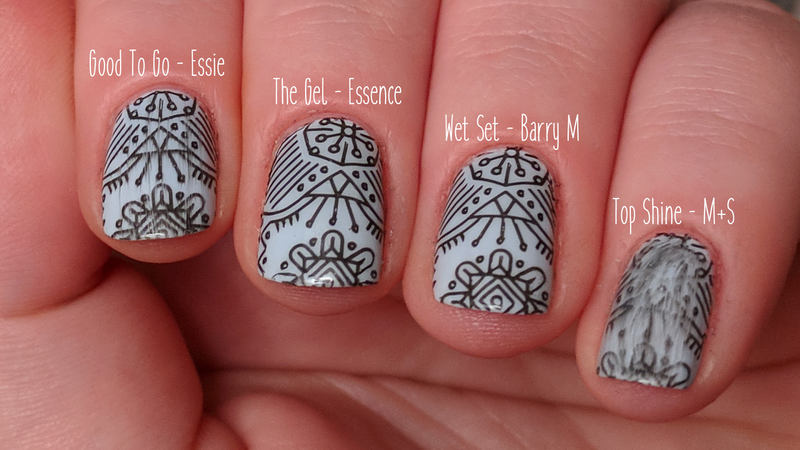 What is your favourite top coat for nail art stamping? What are the ones you avoid?